We all know how important it is to have energy as actors. 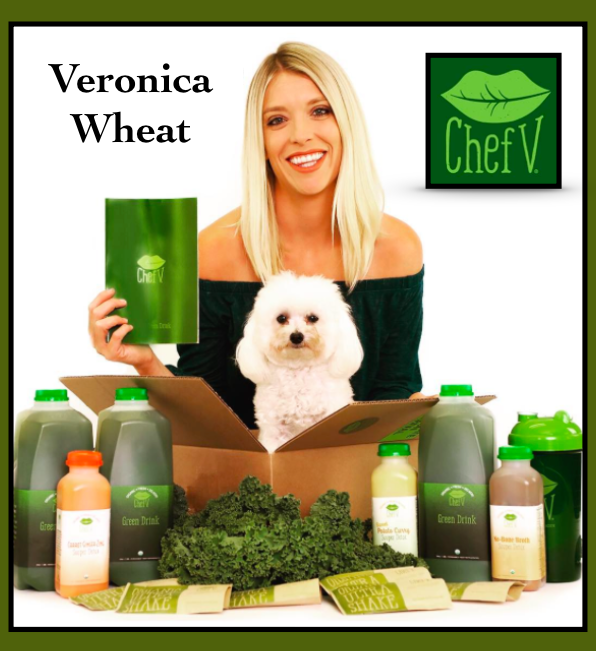 Well, I have been a long time fan of Chef V’s green drink, cleanses, and other healthy goodies. I had a chance to ask Chef V some questions for our readers. Hope you enjoy! Tell us a little about your background as a Chef? I have worked in restaurants since I was 12. I worked in over 15 different restaurants with a wide variety of experiences. We now service the entire country (except Hawaii and Alaska). We are family owned and operated. My husband and I run all aspects of the business. Of course with the help of our dog child “Mr. CocoNut”. What is your vision with your company? It’s my mission to “Make Cleansing Easier”. My book is even named “Making Cleansing Easier”. Staying true to my brand is important and having products that actually work! I love helping people. Gotta say… I love my Green Drink. Everyone who knows me knows it’s French Fries! Skinny ones extra crispy and if they have truffle oil, WIN! What is your favorite thing to do on your time off? I love to hike and I love yoga, those are my two outlets. We are obsessed with our dog Mr. CocoNut so we often take him to the dog beach or find a dog friendly patio for lunch or dinner. We have electric bikes that we ride all over and have a cute little dog back pack my husband wears. People just crack up when they see us. I love to take little trips places so my husband and I are always on the go. We pack up our truck and go on road trips to Lake Tahoe, Arizona, Camping in the desert, and we love to go to Cabo once a year. We usually do one big trip out of the country each year too, not including Mexico. I have a lot of new projects in the works. I plan on writing more cook books, and start a women’s entrepreneur group. And another goal that I am working on is to be a judge on a cooking show! Thanks so much for helping people and for sharing your time Veronica! My compliments to the Chef! This website does not provide medical advice. This site is for informational and educational purposes only. Content and opinions stated in the articles, interviews, ads, blogs, and links to other websites, are according to each individual, and are not necessarily the opinions of Actor Transformation, Kari Nissena, or Bliss Productions. None of the content provided is intended to diagnose, treat, or cure medical conditions. You should consult your physician or health care professional before starting any cleanse, detox, or any other health or fitness program. This is not a promise nor a guarantee of auditions, employment, or career success. Links, ads, pictures and other content on our sites may contain affiliate links. Actor Transformation, Kari Nissena, and Bliss Productions will not be held liable in any way for the content provided. By being on our website, you are acknowledging that you are voluntarily participating and are solely responsible for your results. We are not responsible for any of the content provided on this website. By using our services, training, programs, blog, interviews, links, ads, posts, products, information, or any other content, you implicitly signify your agreement to all of the disclaimers.